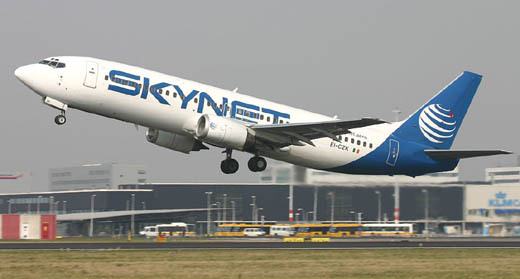 SkyNet Airlines was formed with commercial help from Aeroflot-RIA and started its Shannon-Amsterdam-Moscow (Sheremetyevo) flights in June 2001. Its first visit to Amsterdam IAP was on 25Jun02. It started with only 1 Boeing 737 and only flew SNN-AMS-MOS v.v., though expansion via Warsaw, Vienna and Brussels was expected to be implemented with the delivery of the 2nd Boeing 737. Boeing EI-CZK at Amsterdam IAP (17Mar04), taking off from runway 24. In May 2004 the media reported one of its two B737-400s was returned to the lessor. Plans were revised to add flights between Ireland and St. Petersburg in cooperation with Pulkovo Aviation Enterprise of St. Petersburg). Skynet's executives were desperately negotiating with the US leasing company that grounded its two Boeing 737s in a dispute over payments. Time was not on their side: the Irish airline posted Euro 4.5 million pre-tax losses for 2002 and was believed to owe around Euro 200,000 to Aer Rianta. The end came around 24th of May 2004 when operations were suspended. It remains to be seen if operations, in concert with Pulkovo Aviation Enterprise, will be restarted.